The Donegal Junior League season begins in earnest today, with the Brian McCormick Cup Area Shield fixtures taking place. Brett McGinty, Kildrumn Tigers gets the ball away against Kevin Mulhern, Glenea United last season. 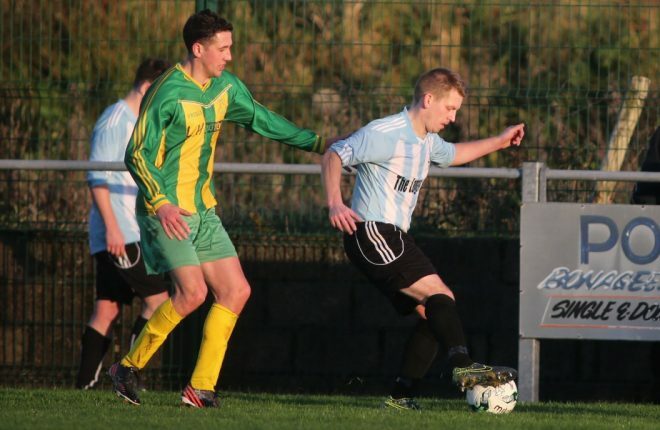 Kildrum Tigers are the reigning champions, and they will be looking to hit the ground running in the Lifford section with a home game at Station Road against Raphoe Town. 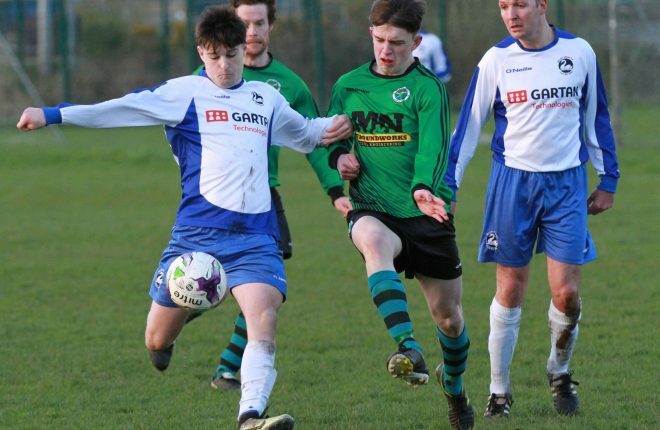 Castlefin Celtic are another team to watch this year, and they will be expected to have too much for Curragh Athletic although Billy Sweeney’s men are tipped to have a good season. Deele Harps have a bye into the semi-final, while the remaining fixture sees Lifford Celtic take on Convoy Arsenal at Greenbrae. Kevin McBrearty, Conal Vambeck, and Stuart Carlin are in charge of Lifford this season, and while their squad has changed considerably over the course of the close season, they will still fancy their chances on home turf. Mickey Rodgers is back as manager of Convoy Arsenal for another year, and he’s looking forward to getting the campaign started this week. “We’ve been up and running for a couple of weeks now and we’ve had a few friendlies,” said Rodgers. “It’s hard to beat the competitive games, and we’re looking forward to getting it started. “Unfortunately we’ll be missing a few boys this week as a couple of our younger lads are away on holidays on Saturday, but there’s not a pile we can do about that. Kilmacrennan Celtic won the Gweedore Area Shield last year, but ended up losing the Brian McCormick Cup Final to Kildrum. Gerard McGranaghan and James Doherty are now in charge of Kilmac, and they have put together a formidable squad over the summer. 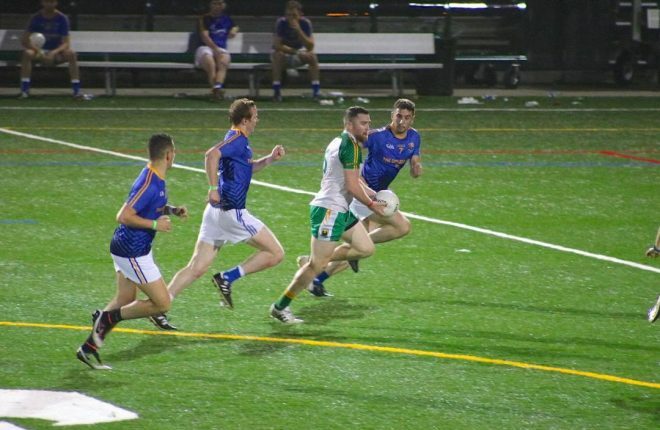 Daire McDaid, Michael Boyle, Seami ‘Nanny’ Friel, Gary Whoriskey, and Garvan Grieve are among the high-profile players to have signed on the dotted line, and they are being tipped as possible league contenders. They travel to Carrickboyle this Sunday to face Gweedore United, and while they will be short some players, they will be favourites to advance to the next round. “I don’t think we will have a full squad available this week with gaelic and what have you,” said McGranaghan. “We still should have a good enough team out but we won’t be taking Gweedore United for granted. “We’ve had a decent enough pre-season and we’re hoping to build on that now. “If we win this week, we have the winners of Keadue and Gweedore Celtic so that would be a good test ahead of the league season. 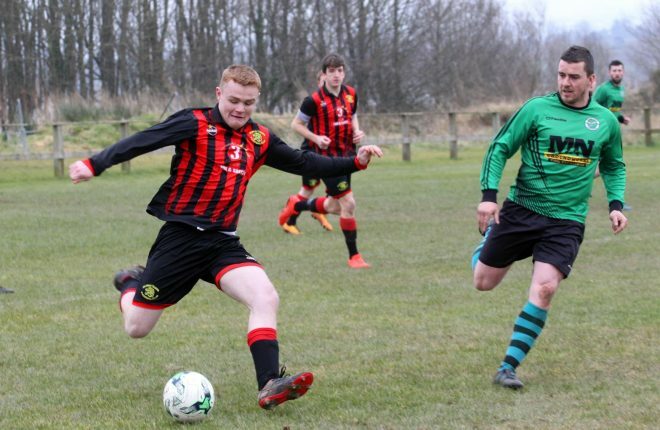 Danny Doogan is gearing his Keadue team up for life in the Premier Division and they should get a decent test against Gweedore Celtic at An Screaban. Hugh McFadden is Glenea United’s new gaffer and his first competitive game is against Glenree United, while Cranford have received a bye to the next round. The big game in the Letterkenny Area on Sunday is the Moss Road derby between Rathmullan Celtic and Milford United at the Flagpole Field. Shaun ‘Budgie’ Sandilands is managing Milford for a second season, and has signed Darragh Black, Dan O’Donnell, Christopher Dillon, Kevin O’Donnell, and James Doyle ahead of the new campaign. Michael Deeney has taken the reins of Rathmullan, and he comes up against the team that he managed during the 2016/17 season. “We’re going to be a bit short this week, but my understanding is that Milford will be too as there is gaelic on Sunday,” said Deeney. “If Milford were at full-strength, then you would have them as favourites. “But if they are missing six or seven then maybe the tables will be flipped. “I don’t like focussing on other teams too much. I prefer to look after ourselves. 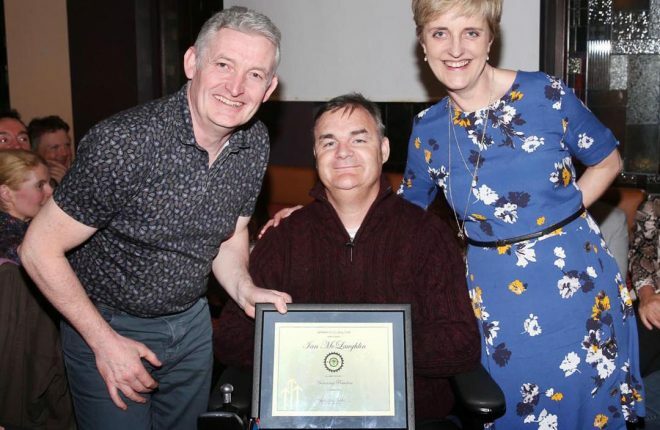 “I have some super footballers at this club like Declan McGarvey, Jay Dee Alawiye, ‘Golf Ball’ (Niall Carruthers), Kevin Doran, Eoin Sheridan and John Paul Doran. “They give us a really strong base, but we might need a bit of back up in our squad. Kerrykeel ’71 welcome John Crawford’s Lagan Harps to Rabs Park, while the meeting of Drumoghill and Whitestrand should be an entertaining affair. Another intriguing game is the clash of Drumkeen United and Bonagee United at St Patrick’s Park. Drumkeen won the Letterkenny Area Shield last season, and their manager Benny Bonner has designs on doing so again this term. 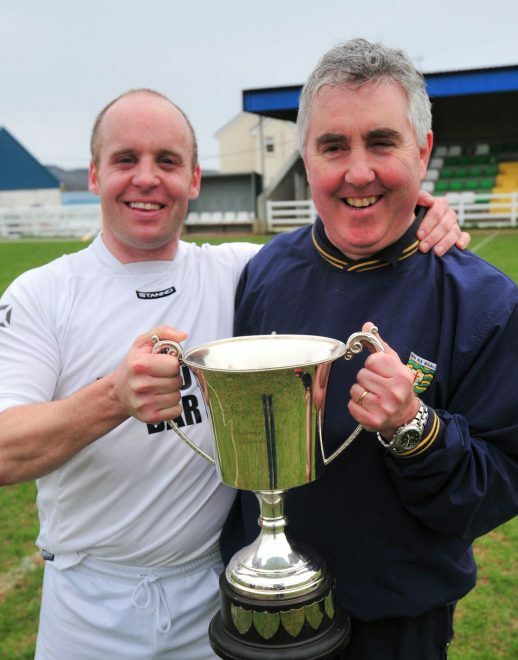 “We did very well in the Brian McCormick Cup last year, and while the league is our bread and butter, we would be hoping to do well it it again this year. “We have a home game on Sunday, and we’re home in the semi if we win that, and the final would be at home too, so we have plenty to play for. “We have put in a serious amount of work since the start of June and we are in good shape. 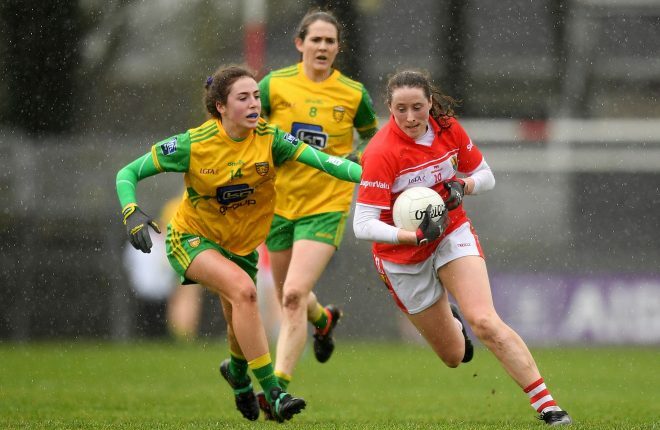 “Bonagee will be a bit like ourselves in that they will have plenty of players with Ulster Senior League experience and we know each other well. 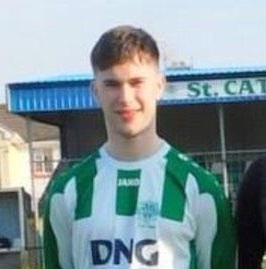 St Catherine’s are straight through to the semi-finals in the Donegal Town Area, while Donegal Town FC will be heavy favourites to defeat Dunkineely Celtic at the Hospital Field on Sunday. Copany Rovers have strengthened during the close season, but they will still be up against it when they host Cappry Rovers. Paddy McNulty is joint-manager of Cappry along with Seamus Doherty this season, and he says they will field a youthful side. “MacCumhaills and Glenfin have big games in the gaelic this week, so we will be going with younger lads. “We played Bonagee on Tuesday night in a friendly, and we were in the Dunkineely Cup Final on Thursday.